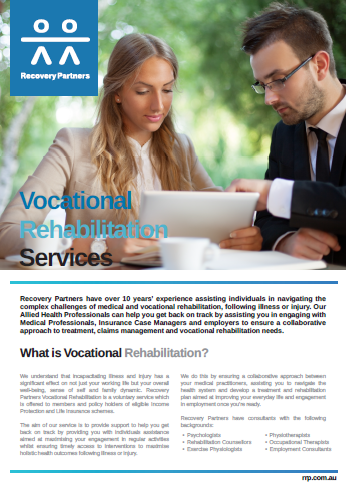 Recovery Partners have over 10 years’ experience assisting individuals across Australia in navigating the complex challenges of medical and vocational rehabilitation following illness or injury. Our allied health professionals help to get individuals back on track by assisting with engaging in collaborative rehabilitation services that are structured to enable all stakeholders the opportunity to promote the health benefits of work and other rehabilitative exercises. We understand the significant role that incapacitating illness and injury can play in inhibiting our working lives, and we work to reconnect individuals with that overall sense of well-being, sense of self, and returned family dynamics. Our vocational rehabilitation services are offered for members and policy holders of eligible income protection and life insurance schemes. The primary goal of our support services are to assist with maximising your engagement in regular activities and promote the access to timely interventions to optimise your holistic health outcomes. Recovery Partners recognise the potential value that rehabilitation services harbour with reports alluding to return on investments scaling from $24 -$39 for every dollar spent on rehabilitation with life insurance claims (Swiss Re, 2014). This, along with the benefits of assisting members and policy holders to return to wellness is at the forefront of what we do. Accordingly, Recovery Partners has invested in the delivery of a proven methodology and a network of vastly experienced clinicians that we believe is currently unrivalled in the market. Too often the traditional approaches to redeployment miss the mark and individuals are left to aimlessly navigate their way through procedural requirements as opposed to working collaboratively toward better health outcomes. Recovery Partners have designed specialised programs to move away from more traditional redeployment approaches by reinforcing a return-to-wellness-focused approach to rehabilitation. By adapting our approach to the individual member’s goals and policy, Recovery Partners consistently achieve sustainable outcomes. 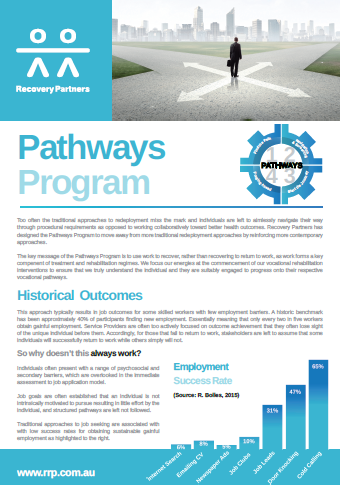 The Pathways Program places a large emphasis on claimants owning their most appropriate path, and equipping them to use networking as a major component of their job search in addition to other traditional jobs seeking methods. Individuals are guided to complete an array of practical activities and personal evaluations to establish how & where they fit, and what path ultimately matches with their personalised profile. Pathways directly targets key modules (“COGS”) that are critical in promoting an understanding of the individual and how they will be successful in managing their future vocational endeavours. Senior facilitators work in tandem with the claimant at the initial stages to discover suitable paths, considering all potential obstacles and resolve for the necessary navigational tools. Subsequent canvassing is then independently aligned to the individual’s COGS and channels their elected final destination. Research demonstrates that an alternate method is required and to promote the best outcomes the individuals need to be heavily engaged to create the momentum and accelerate their potential to own their next journey. We welcome your enquiry. Recovery Partners are able to coordinate for an array of references with respect to our Life Insurance upon your request. Fill out the form for more info on our Life Insurance services and Pathway Program.